While the story is nothing new, the technique is inventive. My hat is off for conceiving this and managing to execute it in a single take. You can read about the production of this here. 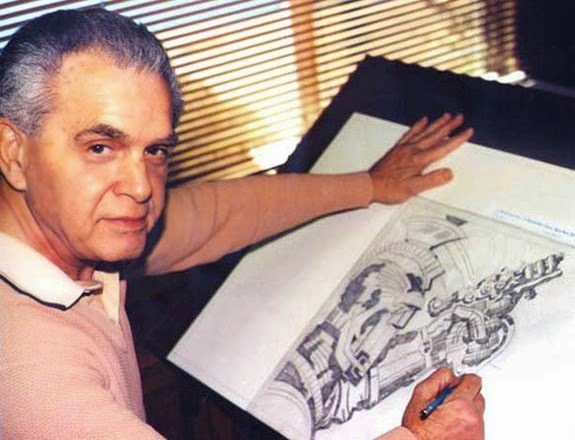 Next Monday, the Supreme Court of the United States was to announce whether it would hear an appeal from the Jack Kirby estate over the estate's copyright claims. Today, Marvel and the Kirby estate jointly announced that they have reached a settlement. I hope that more details emerge. From my perspective, I hope that Jack Kirby receives co-creator credit on the various comics he spearheaded with Stan Lee. Furthermore, I hope that the estate receives royalties on Kirby reprints, Kirby designed merchandise and the flood of superhero movies that are being made using characters that Kirby designed and co-created. There are people who are constantly commenting on various news sites that Kirby's children and grandchildren had nothing to do with creating the work and so don't deserve anything. My response is that Robert Iger and the stockholders of the Walt Disney company had nothing to do with it either, yet they're making money from it. Why do their rights trump Kirby's family? I congratulate the Kirby family for their persistence. If Jack and Roz Kirby were alive, they would be very proud that their family stood up to one of the largest entertainment conglomerates on the planet and made them acknowledge the value of Jack Kirby's work. It's nice to get a happy ending. While comics are not animation, there is a great deal of overlap, both in terms of artists as well as how artists are marketing their work these days. 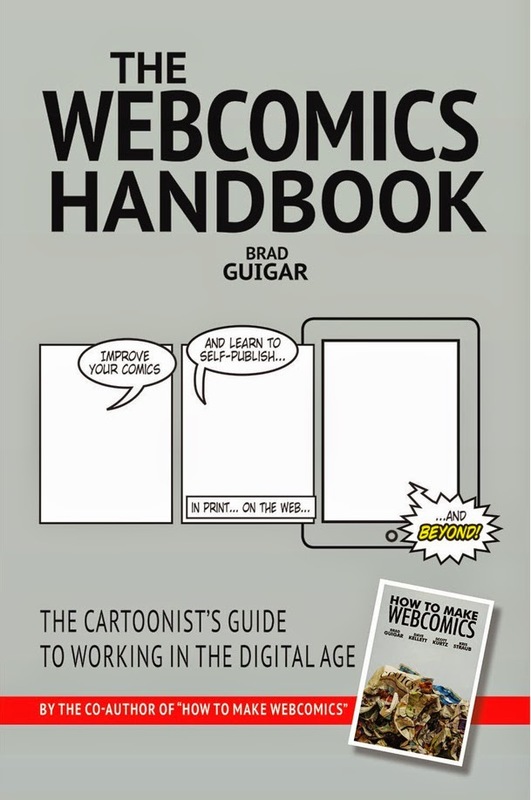 In this way, animation artists who are interested in using the web as a revenue source, or are interested in self publishing or exhibiting at conventions can find a wealth of advice from Brad Guigar's The Webcomics Handbook. Guigar has been doing webcomics since 2000 and is the founder of Webcomics.com, an online site dedicated to sharing knowledge with artists who are marketing and selling their work online. He is the co-author of How to Make Webcomics, a book I plugged earlier. The value of Guigar's latest book is how incredibly specific it is. If you're looking to create a website with earning potential, Guigar will talk about various hosting sites and their relative advantages and disadvantages. He lists the various approaches to securing advertising for sites. He even has tips for speeding up page loading. Guigar talks about the pitfalls of collaborating and how to avoid them. He has a chapter devoted to self-publishing, including information on print-on-demand vs offset. He has a chapter devoted to conventions and how to best present yourself at them as well as the economics of attending shows. Other topics include copyright, contracts, insurance, search engine optimization, collectives, merchandise, and booth barnacles (fans who hang around your table at cons and monopolize your time without buying anything). I have never seen a book about artists using the online world with as much practical advice. My only complaint is that the book lacks an index. However, that is a small complaint. If you have ever considered using the web as a revenue source, there is something in this book that will help you. The Ottawa International Animation Festival starts on September 17 and studios will be there to recruit. As well, Nickelodeon will be there soliciting pitches for preschool shows. I'd like to issue a challenge to Nickelodeon and any studio that takes pitches, though I'm confident that this challenge will be completely ignored. I'd like studios that are looking for pitches to make their minimum deal public. How much of the copyright, if any, will the creator get to keep? What screen credit will the creator be guaranteed? How much will the creator get per episode that's produced? What guaranteed employment will the creator get on the project? What percentage of online, merchandising, publishing and home video revenues will the creator get? While I have no confidence that companies like Viacom, Disney, Warner Bros. or Fox will take this challenge, it presents an enormous opportunity for smaller studios looking to own intellectual property. Imagine a studio that offers to let the creator keep half of the copyright and half the profits from all revenue streams. Creators with confidence in their ideas would be fools not to take their work to that studio first. Imagine if a studio agreed that if the project wasn't viable after a limited time, the creator could recover 100% of the copyright in exchange for reimbursing the studio for it's production and marketing costs. We're in a transitional period. What we think of as TV is shrinking and the online world of Netflix-like and YouTube-like entities are expanding. Before the online world solidifies, as it inevitably will, a studio able to attract the best content because it offers the best deal would have a competitive advantage. It would obviously benefit creators, but the point is that it would be good business all around. Media companies hate bidding wars. As early as 1909, Biograph was trying to suppress the names of their performers, afraid that they would ask for more money. However, Carl Laemmle hired Florence Lawrence and Mary Pickford away from Biograph and publicized them in order to increase demand for his films. As much as media companies would prefer it otherwise, the business is based on talent. If a studio is taking pitches, what will it publicly guarantee to the talent? And if you're a creator, do you have the nerve to demand to know the deal before you make the pitch? UPDATE: Those of you interested in what's happening to TV in Canada should read this article in The Globe and Mail. It's a good summary of all the potential changes that are coming and how it might change the production landscape. The reader comments show the level of animosity towards the cable companies and broadcasters. You can't hold an audience with regulations, only by giving them something they want to watch. There's an alternate TV universe developing in Canada. It looks a lot like the old TV universe. In fact the majority of the programming comes from the old TV universe, but there's an important difference: it comes via the internet and not cable channels. So what? Well, you can impose Canadian content quotas on cable, because no service gets on cable unless the Canadian Radio and Television Commission approves it. And the CRTC always imposes conditions on any license it grants. However, the CRTC has decided to keep its hands off the internet, precisely because it can't stop anyone from using the internet to distribute content. There are huge repercussions from this. First, when there were limited channels available and they had to run Canadian content, there was a demand (even it if was mandated demand and not audience demand) that had to be filled. Second, when the public paid for cable TV and when the cable channels earned money from advertising, a percentage of the money was put into the Canadian Media Fund, which provided money for the production of Canadian content, including animation. The problem started when Netflix came to Canada. It allowed viewers to pay a flat monthly subscription rate to watch anything on the service. As Netflix arrives via the internet, it has no legal obligation to put money into the Canadian Media Fund or to use Canadian content. When a generation of young adults who have declined to have cable TV combines with disgruntled viewers who cut their cable to lower their bills, the cable companies panic. Their billing is dropping and the shrinking audience will force advertising revenues downwards as well. That's a one-two punch aimed at Canadian content. Shaw and Rogers, the two largest cable TV providers, are fighting back. They're collaborating to create Shomi (pronounced "show me") to compete with Netflix. That's like Coke and Pepsi collaborating on a new soft drink, a move that could only be driven by desperation. Bell Media has just purchased a library of older shows from HBO for their own version of video on demand. Suddenly, the cable TV business has the cooties and everyone is running away from it. Because these new services are on the internet, there's no obligation to run Canadian content and none of the subscription money goes to the Canadian Media Fund. This will make it harder to produce original animation in Canada. With lower ad rates, less money in the Canadian Media Fund and the audience abandoning cable, there will be less demand for Canadian content and it will be harder to finance. For better or worse, studios interested in creating shows will have to compete with the rest of the world, without the government carving out a protected space for them. There will still be service work, but that doesn't bode well for the future of Canadian animation. Service work is sensitive to currency fluctuations. The Canadian dollar has ranged as low as 63 cents and as high as 1.03 compared to the U.S. dollar over the last decade or so. In addition, there is the volatility of tax credits and government subsidies. The new government in Quebec has cut their tax credits due to their deficit. Any deficit-ridden government (which is all of them at the moment) will be looking hard at expenditures. Service work is great for cash flow, but the flow stops when the job is delivered. There are no residuals and no money from merchandising. Studios doing service work are always just a few months away from a potential bankruptcy. This could be a great opportunity for Canadian studios, forcing them to cut the government's apron strings and grow up, but I'm doubtful. History hasn't demonstrated that Canadian studios are eager for that challenge. In the last 35 years, no studio has walked away from government protection or money to stand on its own. While Canadian animation is booming right now, the future is uncertain at best. The entire notion of Canadian content quotas may disappear quickly, not through government decree, but through cable TV erosion. While Canadian studios have worked hard to satisfy the regulations, now it's time for them to focus on satisfying the audience if they want a healthy future.